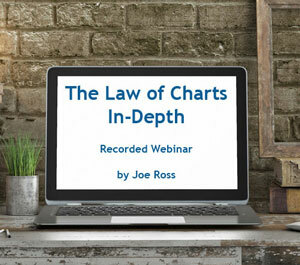 Go deeper into "The Law of Charts™"
Joe Ross will explain to you the way he stacks up profits with tips and tricks that make it easy for you to apply "The Law" to YOUR trading! This is the most requested recorded webinar, The Law of Charts. Through this recorded webinar The Law of Charts, we will show how YOU how to win consistently in any market and in any time frame. What it takes to create charts that exactly fit your trading style and level of comfort. The content of this intensive, in-depth recorded webinar takes the "The Law of Charts" to the next step. 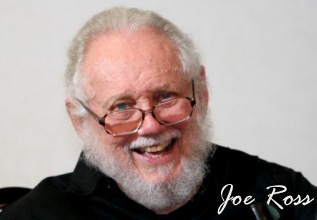 You'll feel like your attending a private seminar with Joe Ross himself. This recorded webinar on The Law of Charts brings you the pure simplicity of what the markets are all about. Trading does not have to be complicated. Everything you need to know in order to make money in the markets is right there in front of you when you look at a price chart. It's much easier than you've been led to believe. Why is it so important to have a trading concept? Because of a known fact that is pretty scary: The majority of traders lose money in the markets, or barely make it. But what about those who are successful? Imagine the following situation: 10 people are sitting around a table and everybody puts $100 in the middle. After a few minutes, one person stands up, takes most of the money, and leaves. 9 people remain sitting at the table fighting over what's left. Which of these people do you want to be? You don't have to wait for a miracle - trading skills can be learned, but you have to let Joe show you how it is done! an easy way to enhance the advantage. Believe it or not, you already have an edge over the other people at the table who are still fighting for the leftovers. Why? Because you have decided to trade with a concept that can lead you through the markets and guide you along to consistent success in your trading! You have no idea how many emails we receive every day in which traders ask for help because they have lost in the markets, and have to deal with yet another loss. If you do not want to experience loss after loss, and if you really want to become a successful trader, then you definitely should start trading with a defined concept. We have seen a lot of trading systems come and go. Often they are called "Killer" or "Monster" or even "Hyper" trading systems that say they will "make you rich in just three months." You know exactly what we are talking about. Joe Ross’ original trading concept "The Law of Charts," which is the first EBook you can recieve when you sign up for the Free Trading Materials, does not need any kind of hype. It has helped many to trade successfully and profitably for years. It doesn´t need any power words like "monster" or "killer" because it has proved its worth. You may have read about this simple concept on our website, and you have seen it "in action" in our free weekly newsletter, so you know that The Law of Charts can be used in any market and in any time frame, and it doesn´t matter where you apply it to produce consistent profits. THE LAW OF CHARTS EBOOK? The free Law of Charts EBook presents details of the formations that make up The Law of Charts. That's it! The content of the free material goes no further than that. The recorded webinar, presented by Joe Ross himself, will give you a very brief presentation of the Law of Charts formations and a very detailed explanation of how to implement the Law of Charts for making profits. We want to teach you to understand and show how to take advantage of the markets. It also reveals one of the most essential factors in trading called "Market Dynamics". Where are prices most likely to move next? Why do prices move to where they move? How far are prices likely to move when they do move? PLUS: Let us show you some of the best ways to follow market momentum and thrust: the source of market momentum, the cause of market momentum, and how to take advantage of it, to put profits into your pocket. It takes you through some very interesting uses of indicators that will assist you in filtering Law of Charts formations. Typically, we're not users of indicators the way they were created to be used, but using indicators in unconventional ways to determine when to use Law of Charts formations, and to filter out the best of the best prior to entry. In addition, we give you the rationale behind the Traders Trick Entry™. You will learn what causes Ross Hooks™, and how to trade them. You will see how and when to use the Law of Charts when prices are in consolidation. There is more, much, much more in this webinar with slides showing you information that you haven't read even in our free Law of Charts material, nor in any of his other books. As mentioned, we offer the concept at no cost when you subscribe to get our Free Trading Materials and, as you may have recognized, it is easy to understand; and once understood, it is also easy to apply in the markets. But sometimes it takes just a little bit "more" to completely experience the full power of The Law of Charts - the power that helps you trade with such incredible insight. Every time you view a price chart, the truth you need for making money is staring you in the face. It is looking right back at you. Our students have verified that once you understand the markets, all you’ll ever need to trade them profitably is an understanding of the Law of Charts along with the dynamics of the market. We present some indicators, but they are used in an unorthodox manner. People think that the more complicated something is, the better it is, but the truth of the matter is just the opposite. Look at the truth of the markets in virtually every scene. There is truth in every price bar you see, and in every group of price bars there is additional truth. It doesn’t matter whether you use traditional or candlestick price bars. You can see the truth with line or point and figure graphs. The truth is the truth, and you will find it on the charts. You will come to see the truth as we guide you with additional valuable comments and which are not found in an indicator, a mathematical formula, Fibonacci ratios, Elliott Waves, or Gann theory. We don’t mean that people cannot make money using those things. What we do mean is that if you are able to throw off all the complications of theories, indicators, and mathematical ratios, you can come to see what is really there on the chart when you look at it. The truth is simple, and the charts follow a law which Joe named a long time ago "The Law of Charts." Explore the depths of "The Law of Charts™"
Learn how to apply the law to your trading so that you can start trading more deliberately and more successfully the next time you trade. ► Where will prices move next? ► Why will they go there? ► How far will they go? Learn how to identify a trend before everyone else sees it, and how to enter the market ahead of most other traders. You'll see exactly how a master trader conquers the market. This recorded webinar will completely change the way you look at the markets. You will never see the charts as you did before — you will be able to read them like an open book. Many former seminar attendees/viewers told us that what they learned in the first hour was worth the price of the entire webinar.